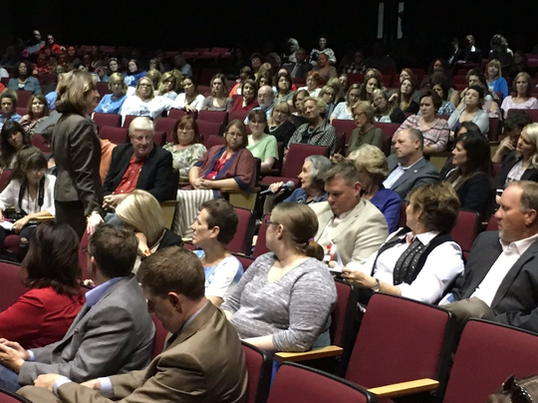 OKLAHOMA CITY (Dec. 14, 2016) – More than 1,000 parents, teachers and community leaders attended a series of education town halls hosted by State Superintendent of Public Instruction Joy Hofmeister. She traveled to seven sites across the state to gather feedback from stakeholders to develop strategies for improving public education. The first town hall took place Oct. 18 in Duncan. Hofmeister also visited Ada, Oklahoma City, Tulsa, Enid and Yukon before concluding the town hall series Dec. 12 in Muskogee. The Oklahoma State Department of Education is using the collected feedback to develop a state plan under the new federal Every Student Succeeds Act (ESSA). That measure reauthorizes the Elementary and Secondary Education Act and replaces the No Child Left Behind Act of 2001. ESSA restores greater flexibility about federal education policy to states and districts. 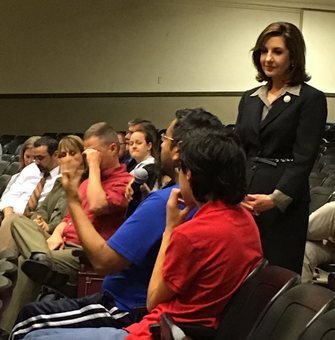 The primary concerns Hofmeister heard during the town halls were funding challenges parents say are impacting class sizes, the effectiveness of teachers and variety of course offerings. Participants said the success of schools depends on family and community involvement, strong leadership, safety, engaged children who want to be in school and rich preparation for college and career. When asked what traits define a well-rounded education, participants cited fine arts, relevant wrap-around services and out-of-school experiences. “Listening to parents and educators – the ones who are closest to our schools and know our students best – is of the utmost importance in determining the course of education in Oklahoma. Combining those insights with proven, research-based practices and adequate resources will help us provide our schoolchildren with the tools they need to become successful adults,” Hofmeister said. This summer, public feedback was also collected at the OSDE’s EngageOK on the Road professional development conferences, which were held July 18-28 in Broken Arrow, Sallisaw, Durant, Edmond, Woodward and Lawton. Nearly 6,000 people attended. OSDE opted for the road show format to conserve funding. In 2015, the statewide conference held at the Cox Convention Center cost the agency $350,000. This year, total expenses for the six mini-conferences were $18,000, a savings of $332,000.